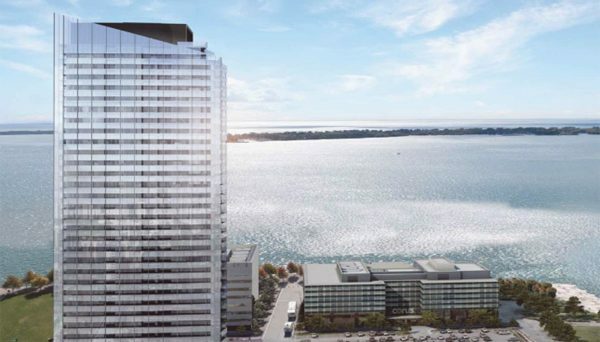 Imagine a neighborhood that lives both in the sky and along the shoreline-- a pairing that could be yours at the newest Lakeside Tower launching with the best views of the lake and city yet. Developed by the Canadian arm of the globally-recognized Greenland Group, this development will help transform the waterfront into a thriving community of soaring towers sailing above an urban backyard. The Residences of Lakeside Lake Suites have a tentative occupancy of 2022. This tower will rise 39 storeys into the sky, however, all but the top two floors of the building are considered the second phase as the penthouse levels are considered a separate phase. Residents will enjoy a world-class address in this East Bayfront Condominium situated just west of Lower Sherbourne Street. From here, one can enjoy eclectic public spaces, cutting-edge culinary experiences, and exceptional shopping destinations, minutes from Lakeside’s lobby doors. If you are a city dweller looking for the right place between beautiful lake views and engaging city attractions, this project might just be it. Contemporary and attractive perfectly describes what to expect from the buildings communal spaces. The lobby’s timeless design combines high-grade natural elements to create an intimate space that resembles that of a boutique hotel. 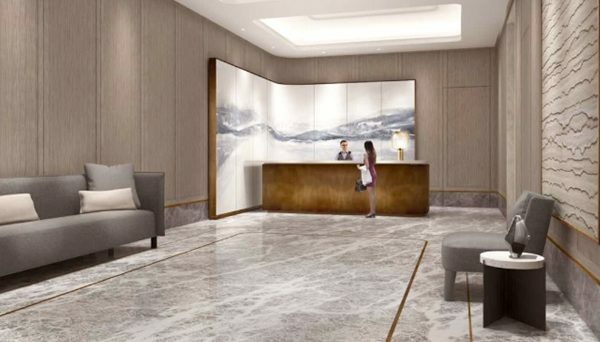 Crafted wood panels and smooth marble tiles add a sophisticated base and backdrop to the concierge desk. The facilities here are optimized for function and leisure. Enjoy a sleek media lounge with a bar/kitchenette. The buildings fitness centre offers state-of-the-art equipment perfect for any work-out plan. Not to mention, a private dining room provides residents and their guests an exceptional space to entertain. Step outside where one can enjoy a relaxing putting green or grill some favourites on the BBQ. After hosting some friends and family, cap off the evening at the Fireside Lounge. Contemporary design extends all the way from the shared spaces to every inch of your suite. Floor to ceiling windows offer the most splendid panoramic views as balconies and terraces are perfectly positioned to enhance your new waterfront lifestyle. Open concept floor plans include one, two, and three bedroom designs ranging from 477 to 1,101 square feet. Each kitchen features marvelous backsplashes and countertops made from porcelain and quartz. Modern appliances and integrated shelving are exquisitely designed and selected for contemporary living. Bathrooms will be your very own oasis where idyllic details, features, and finishes top off the contemporary theme throughout each suite. Condos at the East Bayfront neighbourhood present a great investment opportunity. A picturesque location right on the shores of Lake Ontario, this pocket is a part of the “Lower Precinct Plan”. This planning project is an ongoing strategy spearheaded by Waterfront Toronto and the city to address the substantial growth expected for the area. The most recent revitalization to this area has been the Queens Quay revitalization. This project saw the introduction of tree-lined, multi-use promenade created along the waterfront, now popular amongst joggers and cyclists. Additionally, a new streetcar line was added, which now connects Union Station to the East Bayfront Area. As the area is on track to increase significantly in density, several large-scale mixed-use developments are under construction. One of which will create teaching facilities for both OCAD and George Brown College, along with developments that will make room for 2,000 jobs. There will be commercial space here too, which will create approximately 8,000 additional jobs for the area. This condominium site is also directly beside the proposed “Quayside” community by Google’s Sidewalk Labs. This new technology and urbanism-inspired community will span 12-acres and is primed to make Toronto a global technology destination by including residential, office space, new streets and a new headquarters for Google. Commuting here is easy, thanks to a variety of public transit options. Bus service runs along Sherbourne Street and Parliament Street, connecting you directly with subway lines 2, while the Queens Quay streetcar line takes you directly into Union Station. It scores a 91 on its Walk Score and a perfect 100 on its Transit Score. 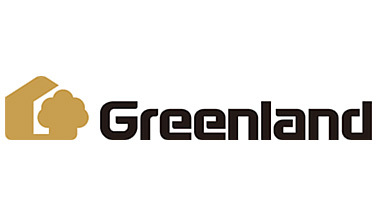 Since 1992, the Greenland Group has experienced steady growth in market expansion and now have properties all over the world. Considered one of the largest international developers, they specialize in large-scale projects that include condominiums, hotels and commercial space in countries including London, Paris, Melbourne, and New York. This is their second development in Toronto.